Since the broadheads are the first pieces of equipment that will make contact with the deer’s body, it is very essential for you to look for the best crossbow broadheads to achieve effective results. There are a few different kinds of broadheads available out there for you to choose from. 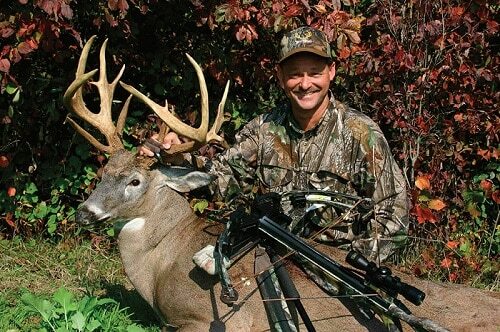 To make your task easy, we performed a research by collecting information about several top-rated and reliable crossbow broadheads and short-listed the 10 best crossbow broadheads for deer hunting. That wasn’t the end of our research since we also kept reviewing these 10 best broadheads in real life by using them with our crossbow for deer hunting. With the completion of our research on the best crossbow broadheads to hunt deer, we have come up with the review of the 10 of the best ones available in the market which can help you in deer hunting at any situation. We will also be presenting you a crossbow broadhead buying guide with detailed information about every aspect you need to look for while choosing the best crossbow broadhead for deer hunting. 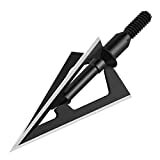 Being at the top of our list, the Rage Bowhunting CrossbowX Mechanical Broadheads[/easyazon_link] are one of the highly precise mechanical broadheads you can find in the market. These broadheads are designed in such a way that they can produce 2 inches of cutting diameter with the ultra sharp blades. Considering all these features and affordable price tag, this broadhead has been selected as the best mechanical broadheads for hunting. These broadheads have high penetration power with the 0.035″ stainless steel blades which can easily produce 2″ cutting diameter. These broadheads are designed with the Ferrule Alignment Technology (F.A.T.) which help in increasing the speed and energy of the broadheads. They also include a Shock Collar system which helps in proper retention of blades by avoiding their early deployment. A practice head is also included which can be used for learning purposes. They can avoid the early deployment of blades with the Shock Collar system. These broadheads consist of outstanding wound channels. They can be used in crossheads for highly accurate results. Despite having the Shock Collar system, the blades can open at any time. If you are looking for a broadhead that can cut with high penetration power and can be used in crossbows to produce highly accurate results, the Rage Bowhunting CrossbowX Mechanical Broadheads would certainly be your top choice. Using these broadheads with high-speed crossbows would be the perfect combination. Rage broadheads are always on the top of many best broadheads list. Similar to our top pick, the Rage Bowhunting Xtreme Series Mechanical Broadheads are also highly accurate broadheads which can help you in maintaining the kinetic energy for a longer time. With the 2.3″ cutting diameter, these broadheads can certainly result in very high penetration. These broadheads feature the SlipCam design consisting of 0.035″ stainless steel blades which are ultra sharp. The overall parts of the broadheads are designed with stainless steel along with aluminum. These broadheads include a silicon rubber band which load the powerful blades. Similar to the CrossbowX broadheads, these broadheads also feature a practice head as well as replacement blades in case the blades get damaged. The swept back blade angle of these broadheads can help in lengthening the lifespan of kinetic energy and help in longer penetration time. They can penetrate for increased amount of time. They can produce highly accurate results. 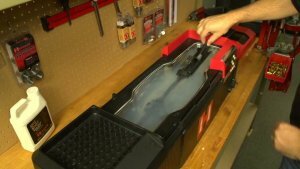 You can get replacement blades while purchasing these blades. They have amazing wound channels. The blades can open at any time. If you don’t like the Rage Bowhunting CrossbowX Mechanical Broadheads, but require high accuracy and high penetration power, the Rage Bowhunting Xtreme Series Mechanical Broadheads would certainly be the best alternative. Similar to the CrossbowX broadheads, these broadheads also feature the F.A.T technology which helps in aerodynamic broadhead flight. The Excalibur X-Act 100 Grain 3-Blade Mechanical Broadhead is one of the best mechanical broadheads available out there. With the use of these broadheads in your crossbow, you can experience some increment in the velocity of your crossbow. The shots produced by your crossbow can be highly accurate with the help of this broadhead. You will get 3 Excalibur X-Act 100 Grain 3-Blade Mechanical Broadheads with the purchased package. It features the Clip Loc blade control system from which prevents the blades from getting deployed before striking on the deer. This broadhead can produce 1.4375 inches of cutting diameter. You will be able to achieve 12 FPS additional speed with your crossbow while using this broadhead. The blades don’t require O-rings or rubber bands in this broadhead. It increases the velocity of the crossbow to some extent. You can get highly accurate results with this broadhead. Its blade control mechanism prevents the early deployment of the blades. Its cost can somehow be expensive. If you are looking for the best mechanical broadhead that can shoot with high accuracy as well as increase the velocity of the crossbow, the Excalibur X-Act 100 Grain 3-Blade Mechanical Broadhead would certainly be the best one for you. Unlike the top two broadheads, this broadhead can totally prevent the blades from getting deployed early without reaching the impact zone. The Precision Official Visionary Outdoors Broadheads can produce very large cutting diameter of 2.0″ and 2.3″ with their two sets of amazing broadheads. They can also create outstanding blood trails. These broadheads are designed with hypodermic design including a front-cutting edge which helps in extreme penetration of the deer by letting the blades enter its body effectively. These broadheads can cut with ultra wide cutting diameters of 2.0″ and 2.3″ inches. You will also get total replacement blades with the purchased package. These broadheads also feature the Shock Collar system which helps in preventing the blades from getting deployed early. You can get outstanding blood trails with these broadheads. You can shoot with ease at the exact same position where you have aimed with the extreme flight patterns of these broadheads. The blades can perform huge penetration by cutting up to 2.0″ and 2.3″ wide area. The manufacturer has offered a 100% money-back guarantee with these broadheads. These broadheads are very expensive. The broadhead blades can bend with the passing of time. If you are looking for a broadhead that can cut very wide and generate amazing blood trails for you to follow, there will be no better option left for you rather than the Precision Official Visionary Outdoors Broadheads Hunting Broadheads. You can also get highly accurate results with faster deployment of the blades with these broadheads. The Slick Trick Standard Broadhead can be a highly versatile broadhead available for you since it can result in a 4-blade hole with extreme blade flight and maximum penetration power. With the help of this broadhead, you don’t have to go through difficult blood trails anymore. Considering all these features and affordable price tag, this broadhead has been selected as the best fixed broadheads for hunting. This broadhead features a Super Steel ferrule to hold the blade. The Alcatraz Bladelock™ system, included in this broadhead, helps in preventing the blade to deploy early by locking it inside the ferrule. You can have 4 different broadheads in every pack. This broadhead is designed completely with the use of steel which ensures the durability of the broadhead. 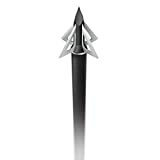 This broadhead features the outstanding mash-up of aerodynamics, penetrating power and accuracy which easily proves the versatility of the broadhead. You will have to go through shorter blood trails. With the unique, patented blade locking system, you don’t have to worry about an early deployment of the blades. This broadhead can cut with very high accuracy and penetration power. The Super Steel ferrule doesn’t get damaged for many years. You might have to change the blades several times since they usually get bent. It has a comparatively small cutting diameter. If you are looking for the perfect broadhead with an outstanding blade locking system which can result in a shorter blood trail, you really need to go for the Slick Trick Standard Broadhead. If you get this broadhead, you will be able to use it for several years to come with its total steel structure. The Muzzy Trocar 100 Grain 3-Blade Broadhead ensures ultimate penetration power along with the high durability of its ferrule. This outstanding broadhead is one of the best fixed-blade broadheads you can find out there along with offset blade design. This broadhead includes a solid steel ferrule that can stay with you for many years to come without any damage and deformity. This broadhead can produce a larger cutting width of 1.1875 inches. It is highly aerodynamic with its 0.035″ blades which can produce results with maximum accuracy even at long distance. A pack of this 100-grain broadhead includes three of them which are already assembled and you just have to use them in your crossbow. You can get results with ultra-high accuracy even when the deer is very far from the shooting point. You can easily use the broadhead in your crossbow without having to assemble it. The right-helix design of the broadhead blades helps in increasing the stabilization power. This broadhead is highly durable. Despite its durability and accuracy, the cutting diameter is quite low. If you are looking for a broadhead that can produce highly accurate results, no matter what the distance is, the Muzzy Trocar 100 Grain 3-Blade Broadhead can certainly be the best broadhead for you. With this broadhead, you can experience extreme penetration power in the deer’s body. With the OTW Hunting Broadheads, 3 Fixed Blades 100 Grain Archery Broad Heads, you will be able to experience a deep penetration with their high-quality tips designed with aluminum. With the compact design of the complete package, you can use these broadheads at any place with ease. These broadheads include 0.02 inches thick blades designed with stainless steel which help in sharp penetration of the deer’s body. You can get all the broadheads in a portable case where you can store your broadheads without any fear of losing them and use them wherever you want. These broadheads can produce deeper penetration size with the screw-in aluminum tips. These 100-grain broadheads are well-designed mainly for hunting and shooting which can help you in experiencing a better deer hunting performance. The overall package is available in a portable box which can be carried anywhere with ease. These broadheads can produce results with high accuracy. The sharp blades can help you with a faster penetration. You will be provided with a 6-month warranty for these broadheads. The warranty period is very less. These broadheads aren’t so affordable. If you are looking for a fixed broadhead that can display an extreme penetration power, the OTW Hunting Broadheads, 3 Fixed Blades 100 Grain Archery Broad Heads can be one of the best options available for you. With these broadheads, you will be able to experience a faster penetration due to sharp stainless steel blades. The Grim Reaper Hybrid 100 Grain Broadheads can produce results with pinpoint accuracy due to the combination of two fixed blades and two mechanical blades. With these 100 grain broadheads, you will be able to start penetrating with the strongly fixed blades and later move on to the mechanical ones. Considering all these features and affordable price tag, this broadhead has been selected as the best hybrid broadheads for hunting. These broadheads can produce results with very high accuracy due to the mash-up of two mechanical and two fixed blades. These broadheads are designed completely with stainless steel. They can display extreme penetration power since the V-notch chisel tip starts penetrating at first, followed by the two sharp fixed blades and finally with the combination of two mechanical blades. These blades can produce cutting diameters of 1-3/16 and 1.5 inches. These broadheads are available at a comparatively affordable price tag. You can expect results to be of very high accuracy with these broadheads. You will be able to experience an outstanding cutting period with the mash-up of two strong types of blades. The blades might be difficult for you to replace. The broadheads blades aren’t so sharp for faster penetration. If you are looking for a broadhead featuring the combination of fixed and mechanical broadhead blades, the Grim Reaper Hybrid 100 Grain Broadheads can be one of the best hybrid broadhead options available out there. With these broadheads, you shan’t expect a faster penetration, but you will surely get accurate results. 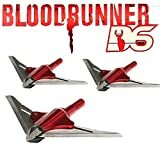 With the Bloodrunner Broadheads 2 Blade D6 100 Grain, you can surely expect a longer penetration period due to the inclusion of the Over-Bore technology which helps in the creation of a larger hole along with less clamping. You will also be able to experience outstanding cutting performance with these broadheads. These broadheads are designed in such a way that they are capable of holding deep six inserts. The Boat-Tail design of the ferrule helps in maintaining a proper alignment between the bolts and the broadheads. With the inclusion of the Over-Bore technology, these broadheads are capable of creating a larger hole with less clamping, thus resulting in a longer penetration time period. These broadheads can produce large cutting diameter of 2-1/16″. You can experience a longer penetration time with these broadheads. These broadheads are highly durable. You can have better blood trail with these broadheads. With the Over-Bore technology, these broadheads can create an outstanding wound channel penetration. These broadheads are available at a huge price tag. In case you need a broadhead capable of penetrating for a longer time period which you can use for many years to come, it is recommended for you to try out the Bloodrunner Broadheads 2 Blade D6 100 Grain for a better deer hunting experience. The BloodSport Grave Digger Extreme CT can produce large cutting diameters of 2.25″ letting the sharp blade penetrate into the deer’s body easily resulting maximum amount of loss of blood. This broadhead doesn’t require any O-rings and rubber bands as well. This broadhead can produce a cutting diameter of 2-1/4″. It is designed in such a way that it starts to cut the deer’s body only when the blades strike on the body. 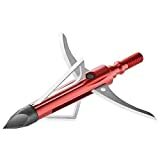 This broadhead features strong blades designed with stainless steel which penetrate the hide and then only gets inside the body to result in maximum blood loss. It includes a patented blade retention system. With this broadhead, you can expect to have a total field-point accuracy. The ferrule is designed with a 7075 aluminum alloy. You can get results with very high field-point accuracy with this broadhead. The blades can result in the maximum loss of blood inside the deer’s body to cause a quick death. 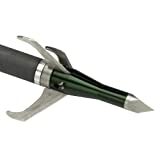 This broadhead can produce a large cutting diameter of 2.25 inches and later with 1.25 inches for penetrating the hide. The patented blade retention system prevents the blades from getting deployed before contact. You can’t use this broadhead for a long time since it can get damaged quickly. To everyone who is searching for the best crossbow broadhead that can produce results with ultra high field-point accuracy, the BloodSport Grave Digger Extreme CT broadhead can be one of the best hybrid broadhead options available for you. A broadhead has a long history in the world. The first broadheads were built and sharpened with stones. Over the period of time, with the advancement of technology, the broadheads have also advanced and broadheads capable for higher penetration have been manufactured. These broadheads developed for aerodynamics are very strong that they can kill any animals, especially deer while hunting with a crossbow. While hunting with a crossbow, a broadhead is a very essential equipment to take the deer down. As mentioned in the earliest section of our guide, a broadhead is always the first equipment that will strike on the deer’s body when you shoot with the crossbow. It really depends on the penetration power, cutting diameter and several other factors of a broadhead to ensure a proper shot in the deer’s body. This is why you really need to spend your time to find out the best crossbow broadheads for deer hunting before purchasing one. There are several types of broadheads you can find in the market. Some of them are better in some cases, and the others are better in other cases. It all depends upon what kind of broadhead you need. Here are the three major types of crossbow broadheads you can find. Mechanical broadheads are one of the most advanced and versatile broadheads you can find. The blades in these broadheads can spread out to a larger area and hence produce large wound channels on the deer’s body. Within a few seconds of the strike on a deer’s body, these broadheads can result in hemorrhage with maximum loss of blood. Mechanical broadheads are also stronger and weigh higher than their competitors like fixed broadheads. If you get mechanical broadhead whose blades can deploy from the rear side, you will be able to achieve maximum penetration while deer hunting. However, one downside about these broadheads is that their blades might be unable to open up during penetration and hence ruin your perfect shot at the deer. The blades in these broadheads are also less durable since they are attached with the ferrule from just a single anchor point. If you are looking for a broadhead that can result in maximum penetration of the deer’s body and turn your perfect shot into a perfect kill, the mechanical broadheads would certainly be your top priority. Fixed broadheads are usually not so strong as compared to mechanical broadheads. However, this doesn’t affect their blades since their blades are highly durable. These broadheads are consist of fixed and immovable blades which are usually designed with a piece of an allow. Fixed broadheads are used mainly for screwing onto the tips of the arrow and are highly suitable for use with compound crossbows. These broadheads can produce amazing cutting results even in stronger hides due to their maximum level of power. The blades in these broadheads are usually bare and might have several issues during the flight. However, the manufacturers of these broadheads include a shorter cutting diameter with these broadheads so that the blades are able to perform well even in the windy area. The blades of these broadheads are very durable since they are attached with the ferrule from the front, back, and all other parts. Hybrid broadheads are the combined form of mechanical and fixed broadheads which can provide you the mashed-up features of both the broadheads. These broadheads are highly reliable and have the ability to penetrate into hard hides as well. These broadheads can be available in two forms; one as chisel tip and then another as cut-on-contact tip broadheads. The chisel tip broadheads can have the chisel tip contact the deer’s body first and later move on to the fixed blades and then the mechanical blades. With the cut-on-contact tip broadheads, you mightn’t be able to penetrate as deeper as the chisel tip ones, but you’d be able to witness ultra sharp blades making highly effective cuts in the deer’s body. If you are looking for a broadhead that can suit your crossbow which can shoot with very high kinetic energy and a larger amount of force, it is highly recommended for you to prefer the mechanical broadheads. These broadheads can help in the complete penetration of flesh and bones of the deer. In the case of crossbows which can shoot with lower poundage, you might want to try out the fixed broadheads with cut-on-contact tips since they can perform maximum penetration in the body. The speed of broadhead highly depends upon its grain weight. Grain weight also affects the quality of wound channel in the deer’s body. If you use a broadhead with larger grain weight, you might expect a larger amount of damage resulting in a quick kill of the deer with your perfect shot. Broadheads with larger grain weights also require a larger amount of force, which is why it might be difficult for you to use these broadheads depending upon your strength. It is recommended for you to prefer the best broadhead which weighs less in comparison to your strength. There are several varieties of broadheads with different grain weights. Most of the broadheads that you will find will have the grain weight from 80 to 150, but the best ones usually possess the grain weight of around 100 to 125. You need to prefer the one which can match with your strength and crossbow. An ideal broadhead needs to have a cutting diameter which matches its penetration depth. It all depends upon what kind of broadhead you need since there’s no exact cutting diameter and penetration depth which can be the best. If you get a broadhead with a larger value of cutting diameter, which can’t penetrate deeper, it is totally worthless. Also, with a broadhead which can’t create a better cut, but can penetrate deeper, you will not be able to get a proper kill with your perfect shot. While choosing a broadhead, you need to look for the number of blades along with its cutting diameter. If you are thinking about getting a broadhead with 1″ of cutting diameter, it is better to get one which includes 4 blades. As mentioned in the guide to prefer the best cutting diameter, looking for the number of blades is also highly essential while choosing the best broadhead. However, there’s no exact number on how many blades a broadhead needs to have. It would be better if you can get a broadhead consisting of 2 main blades. There are several people who also prefer a broadhead with 4 blades for a better cutting capacity. Getting a broadhead with 2 blades and 2 bleeders can also be a good idea rather than preferring one with 4 main blades. The efficiency of wound channel created by a broadhead can help in determining the killing potential with that broadhead. If you are looking for a broadhead that can result in large number of kills, it is better to get mechanical broadheads since they possess a better wound channel. Generally, broadheads are designed with stainless steel, carbon steel or aluminum. If you are looking for a broadhead that consist of ultra-sharp blades, you might want to consider getting one designed with carbon steel. These broadheads might get degraded or turn into rust over the period of time due to the presence of iron. On the other hand, broadheads designed with stainless steel or aluminum would be your top priority if you are looking for a broadhead with maximum strength. You also need to look for the durability of the broadhead by determining whether it is one-piece or not during the purchasing period. All three major types of broadheads (i.e. Mechanical, Fixed, and Hybrid) are better in their own way in different hunting sector. If you are looking for our recommendation on the best crossbow broadheads for deer hunting, there would be no other option rather than preferring mechanical broadheads. With the mechanical broadheads, you can easily expect to have the perfect kill upon your perfect shot at the deer while deer hunting. These broadheads can cut with a wider cutting diameter as well as penetrate to a deeper point inside the deer. These broadheads can be a little expensive, but you would certainly get the best out of your expense. When you are using these broadheads, you don’t have to worry about your perfect shot getting worthless due to winds since these broadheads can still fly with high accuracy, unlike fixed broadheads. If you are using crossbows that can shoot with higher velocity, these broadheads can certainly be the best ones for you even though you aren’t going for deer hunting. They can maintain their accuracy even when they are flying at a higher speed. The mechanical retraction feature of these broadheads allows them to fly better than the other type of broadheads. These broadheads can fly like field points and result in the perfect cut on the deer’s body when the blades get deployed right after striking on its body. With the completion of our review of the best crossbow broadheads, we believe you’d be able to choose the best one depending on your requirements. While choosing the best crossbow broadhead, you need to look for several factors such as the type of broadheads, cutting diameter, grain weight and many more aspects which you can find from our detailed broadhead buyer’s guide above. 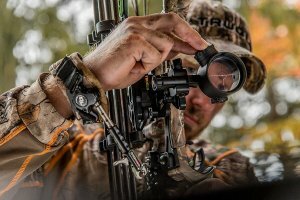 If you are looking for our recommendation on the best crossbow broadheads for deer hunting, there is no better option than mechanical broadheads and the Rage Bowhunting CrossbowX Mechanical Broadhead, which is on the top of our list, can certainly help you achieve a perfect kill upon your perfect shot at the deer. However, it’s all upon you on which broadhead you need to purchase. You really need to know about all the essential factors before getting a broadhead. If you have any queries regarding any of the broadheads or want to know the best broadhead depending upon your requirements, you can feel free to write about your issue in the comments. We’d try to get back to you right away with the perfect solution from our side. Here are our answers to some of the major questions asked by the most broadhead buyers. Q. How many grams does a 100-grain broadhead equal to? 100 grain X 0.06479891 = 6.479891 grams. Q. What kind of broadhead can be the best for deer hunting? Answer: If you are looking for the best broadhead for deer hunting, mechanical broadheads can turn out to be the best producing highly accurate results while deer hunting, even at higher speed. You can scroll over the conclusion of our guide to find out all the reasons on why you need to prefer mechanical broadheads. Q. Is it better to get a 4-blade broadhead rather than a 3-blade one? Answer: With a 4-blade broadhead, you can expect to have a proper flight of your broadheads towards the deer without any disturbances. On the other hand, a 3-blade broadhead can help you if the deer is at a larger distance from you. None of these can be considered better than the another since it all depends on what feature you’d like to consider.